Spread the labor, spread the love. 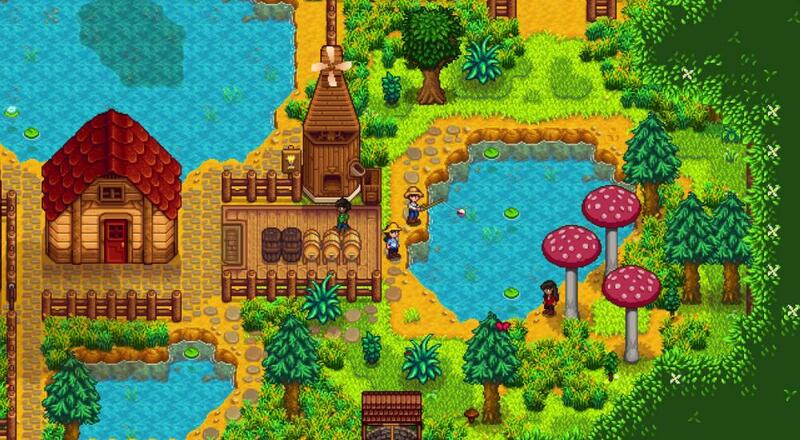 Polish your shears and rev up those watering cans, cause Stardew Valley's four player online co-op mode is getting an official PC release on August 1st! No longer must you cultivate barren fields into bountiful gardens all by your lonesome. In just one week, you can rope up to three unsuspecting online friends into helping you accomplish said cultivation. Exact console release dates are still unknown, but they're listed as "coming soon". In the meantime, those without a home computer will just have to gawk at the PC community as they enjoy these so-called "social activities". Alternatively, they can set the below trailer on repeat and mash on an unconnected controller to pretend they're actually playing, "younger sibling in the 90s" style. This official release comes just a few months after the Beta, so hopefully the folks at Chucklefish (who've taken on the responsibilities of adding the game's online component) have had enough time to hammer out any real issues. If you're interested in trying out the co-op mode once it's officially out, I'd recommend reading this blog post. It was written when co-op first entered public beta, so some of the information will be a little outdated, but it should help you get comfortable with how exactly one starts up a multiplayer session. Page created in 0.8196 seconds.